Tuesday will see the funeral and celebration of the life of one of the TGO Challenge’s great characters. I’ve written before about the extraordinary kindness shown to Challengers by locals. Each year these folk line the routes, provide wonderful service at B&B’s and so on. Amongst the most extraordinary of these folks are Bill and Stan of Loch Callater Lodge, a small cottage on the Balmoral Estate sitting under the shadow of Lochnagar. The story of the cottage is as extraordinary as the hospitality that Stan and Bill (and their partners) have given many of us over the years. Some time ago Aberdeen lads Stan and Bill found themselves pondering the state of an abandoned cottage, and bothy, that sit on the side of Loch Callater. They wrote to the Royal Estate and (I think) offered them a deal. They would restore the cottage in return for a peppercorn/cheapish rent. As they told it to me they were stunned to receive a positive reply, from I think Prince Charles. Over the years the cottage has indeed been refurbished and many walker â€” not just Challengers â€” have experienced the wonderful hospitality of the Lodge. A regular visitor is Prince Charlie himself who strolls over the hills for a wee dram, though I’m told he rarely brings his own bottle! During the second week of the Challenge the Lodge has been an amazing place with people staying inside the house and others camping outside. To be honest my constitution has never really been up to spending an entire night at the Lodge and I’ve satisfied myself with popping in for a quick coffee. I say quick advisably. Nobody gets out of the Lodge that quickly. I remember arriving one morning at 11.00 am to be greeted by Stan, “are you staying for the night”. I think some of the regulars may have given him an odd view of the event! Inside a log fire blazed and warming drinks and soup were handed round. Stan was the perfect host showing us walls festooned with photos of walkers and previous Challenge ‘nights out’. The anecdotes and the laughter came thick and fast. The collecting tin for the Renovation Fund was always prominent, though I did suspect that they had a more flexible definition of renovation than most. It says an amazing amount for the hospitality of Stan and Bill that a visit to the Lodge was one of the highlights of the Challenge for many. And in a nice gesture, Roger and his colleagues at Challenge control have invited Stan and Bill to join the Challenge Dinner at the Park Hotel, where the revellers of the Lodge where able to regroup for one last sing-song! The service of commemoration will be held at Aberdeen Crematorium at 2.40 pm on Tuesday 4th November. Thanks for everything Stan. My thought will be with Stan’s family, and with Bill, tomorrow. Callater Lodge under the brooding skies of Lochnagar. I only met him once, but he was a true gentleman, explaining to me how a proper bacon buttie is constructed, and feeding me the first one I ever ate. I don’t think I’ll ever forget walking into that hobbit hole of a house and meeting that tiny man with such an enormous smile. How right you are. That parlour could have been straight out of a Hobbit of Lord of the Rings set! I had spent some time with Stan and Bill. The first time being on a winters evening, howling wind and some snow blowing on our purple faces. We arrived in the bothy and of course there is no fire there. 5 minutes later in pops Stan inviting us in for a cuppa and a dram. We took them up on the offer and found another 7 or 8 people doing the same. When we came off the hills the following day Stan had made us cups of tea as we arrived and then offered us a lift back to our car. Several trips later and the generosity was still prevalent. I worked with his wife some years prior to this and she too is a legend. It is a sad, sad loss to all who knew and could have known him. Ross, it was my pleasure to have met him, albeit briefly! I just recently received the warm and gentle hospitality of Bill – totally unexpected, as I merely knocked on the door to confirm the location of the bothy. I was immediately offered a cup of tea, place by the fire and bed for the night. 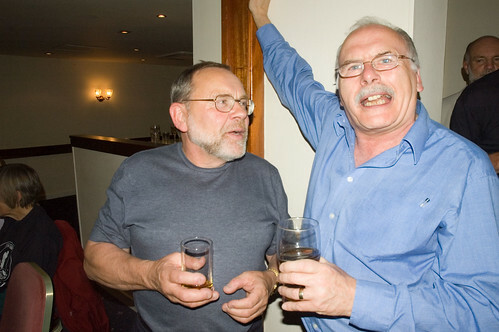 Later, Bill invited me into the ‘Pub’ and regaled me with many a story. My only regret from the time was that I never met Stan, to whom Bill wistfully referred as ‘my mate’. I never met Stan, but can tell that he made deep impressions on all who passed through Loch Callater, so just wanted to pay my respects in a small way. It is nice to know that Bill is keeping the tradition going. 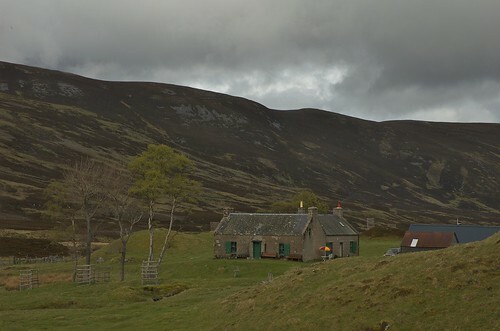 Callater Lodge is still the highlight of the TGO challenge to many of those walking that way and Bill is now a guaranteed invitee to the big jamboree at the end of the event. Glad you sampled the hospitality!